Consumers are organisms of an ecological food chain which receive energy by consuming other organisms. These organisms are formally referred to as heterotrophs, which include animals, bacteria and fungi. Such organisms may consume by various means, including predation, parasitization, and biodegradation. Food web showing the organisms and their trophic levels. Consumers dominate most parts of an ecosystem. Consumers have important roles to play within an ecosystem such as balancing the food chain by keeping animal populations at a reasonable number. 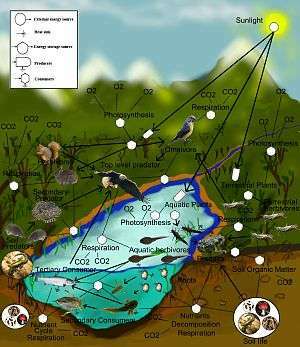 Without proper balance, an ecosystem can collapse and cause the decline of all affected species. This will lead to a severely disrupted ecosystem and a nonfunctional consumer web. ↑ "Venus flytraps' carnivorous ways enable it to do photosynthesis better". Cornell Center for Materials Research. 5 March 2008. Retrieved 9 February 2012.